Another dessert restaurant looks set to open its doors in Peterborough. With TAMU in Cowgate proving immensely popular and Creations Dessert Lounge expected to open its doors next week in Burghley Road, on the edge of the city centre, it might appear that Peterborough is well covered for savoury treats. But Kaspa’s Desserts are getting ready to move onto Bridge Street to offer their range of sundaes, waffles, cakes and shakes. The announcement of yet another dessert restaurant in the city was made by Peterborough City Council leader Councillor John Holdich in his column for the Peterborough Telegraph. And Cllr Holdich was not concerned that the addition of Kaspa’s to the other sweet offerings in and around the city centre would lead to an increase in obesity. He said: “I’m pretty relaxed about it. It’s providing what the customer wants. Firms don’t set up businesses without doing some research. “I think people are absolutely voting with their feet. TAMU seems to be packed out and they are going to be offering different things. “All these places these days have low fat offers and healthy offers. 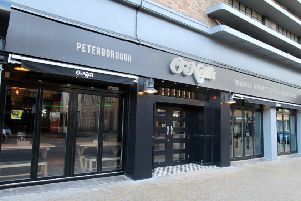 It has not been possible to contact Kaspa’s to find out when they intend to open in Peterborough, but on its website it says that a restaurant here will be ‘opening soon’. TAMU has a second restaurant open in Broadway and there are believed to be plans for a Creams franchise on Lincoln Road. Creations Dessert Lounge will be able to seat 35 to 40 people and will have a private room. And it will be serving a wide range of desserts - waffles, crepes, sundaes, cookie dough, gelato, cakes and milkshakes.